This is the gem of Door County. Peninsula State Park is so big it makes its own little peninsula off the western side of Door County, just north of Fish Creek. It’s my opinion that it has to be one of the most popular state parks in Wisconsin! There are 472 camping sites, dispersed among 5 different campgrounds: Nicolet Bay, Tennison Bay, Weborg Point, Welcker’s, and 3 sites in the Group camping area. All have nice shower and bathroom facilities. We usually camp in Tennison–it seems just the right distance from both Fish Creek and all the park attractions. If you’re not into hiking or biking the miles of trails around the park there are plenty of very beautiful scenic drives up along the bluff. The Niagra Escarpment juts out here to produce some stunning views of Green Bay. The White Cedar Nature Center, which is very close to Tennison Bay campground in the park, is a cute little place to explore some naturalist displays. They even have an interesting wildlife feeding station by it. We once watched 2 red squirrels posturing for the best feeding “territory” on the feeders–what a show! The American Folklore Theatre, a totally outdoor theater, puts on some great plays in the summer. One summer we saw “Belgians is Heaven”, a humorous story about 2 farmers in the afterlife–what a gas! “Guys On Ice” was also an extremely popular one. There’s a fantastic and huge sandy beach at Nicolet Bay. Swimming isn’t always the best as the water’s generally pretty cold in the early summer, but it is still beautiful. We just spoke with Sue who run’s the concession down there and she reports the beach is clean and ready for your arrival – so come on down! Tell her Hi! Once we tried golfing on the 18-hole course on the north side of the park. Definitely a course where you want to rent a cart. Beautiful and pretty well maintained for a public course. Eagle Tower is toward the north side of the park. It’s great if you have the stomach for heights. The tower itself is 75 feet, and the bluff it sits on is 180 feet. 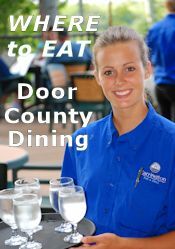 We have a video of the view from atop on DoorCountyNavigator.com. Make sure to watch out for the abundant poison ivy–it is everywhere. Don’t cut through the woods between campsites, you’ll definitely regret it. Stay within your site, and on the roads to get to the bathrooms and water pumps, and you’ll be fine. The only advice I’d give for improvement is better ventilation in the shower rooms. It’s so steamy after you’re done with your shower that it’s difficult to get clothes back on. And you really can’t open the door to let out any steam while you’re in a towel. Best time of year to go? Either very early in the spring to see the forget-me-nots (just stunning! ), or in the early fall to see the fall colors (make sure your camper has a heater, or electric blanket). Both times are great. Frankly, any time of year is beautiful in Peninsula State Park. You really can’t go wrong. Peninsula State Park has a little bit of everything. Great hiking and biking trails, American Folklore Theater, a great beach at Nicolet Bay, a 180-foot observation tower, a gorgeous 18-hole golf course… plus a lot more. You can even take your own boat out to horseshoe island to explore (but, no camping there). Here’s a listing of current events around the Park. As an experienced camper, Peninsula State Park was a little novice for me personally. However, my girlfriend and her kids had a blast. It was a great place to bring a family because there was just so much to do. It was a little crowded for my tastes, but as a family vacation it was perfect. We had such an incredible time. It is a huge park and it isn’t one little Peninsula, the kids swam all day and even made new friends. Good times! I have camped at Peninsula State Park on four separate occasions. Peninsula State Park has very beautiful scenery and many things for campers to do, such as hiking and swimming. The campsites allowed you to pull your car right into the campsite, and the sites were spacious. It was nice to have a reasonable amount of separation from your neighbors. The best campsite was on the lake, and we were able to anchor our boat right at our campsite, which was very convenient and a lot of fun. My friend and I camped in Door County (Peninsula State park) every summer for 4 years and had the time of our life. It has everything you could want. 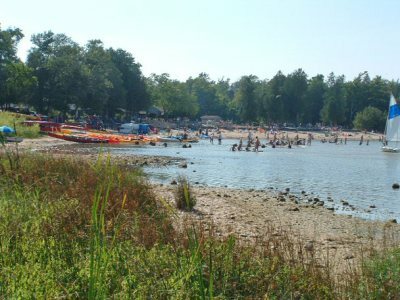 Quiet campgrounds, swimming, sight seeing, shopping, great restaurants, and more. I will definitely be back!